Pushing your bub in a pram sounds like a no-brainer but when you’ve never done it before it’s actually a lot trickier than you think! Here are seven things that go through every mum’s mind when she suddenly has a baby on wheels. Prams are so fandangle these days. They usually have lots of nifty features and different settings to allow you to adjust it for the age of your bub which is actually super helpful, until you realise you’ve accidentally had your newborn in the wrong position all day. You stop, you fiddle around, you make it worse and end up cursing yourself for not bringing the baby carrier instead. Top tip: Always read the instructions carefully, enlist the help of someone who isn’t currently sleep deprived, and then reset it as your child progresses. Remember, if it looks and feels wrong when you’re out and about then don’t be afraid to ask a stranger for help. It’s a good idea to check the tyres for air and punctures before setting off anywhere too. Nothing worse than a flat. 2. Can I drink, push, and talk? 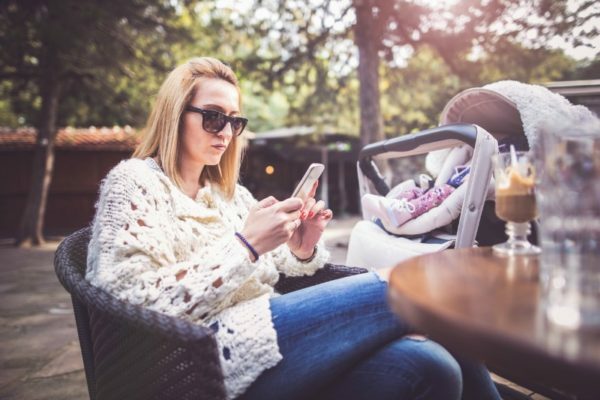 Many first time mums think they will be spending their maternity leave out and about, breezily pushing their baby in a pram while sipping on a latté. But unless you have a pram with a drink holder, things can get a little bit challenging. Especially if your fandangle pram is missing this vital addition, and your phone rings. Suddenly you’re head to shoulder, pushing one-handed all while trying not to spill hot coffee on your baby. Awkward. Sure you could stop, but then you’ll be struggling to hear over the impatient screams of your newborn. Top tip: You can guarantee you will need coffee and fresh air at some point, so go the extra mile and get a drink holder on your pram. 3. How do I get up there? Shopping centres, parking stations and basically any destination that requires you to get up multiple levels with a pram will slow you down. Especially the first time. The stairs are no longer for you, and you can forget using the escalators (that’s really only for the experienced among us). The elevator is now your only option, but where is that thing? Top tip: Ensure you locate the elevators before you park. Prepare to factor in some extra time for getting around because you often spend ages waiting for your lift to arrive. 4. Where do I park this thing? Getting around with a pram takes some getting used to. They’re big, awkward to manoeuvre and often bulky. Then there are all those pesky people you need to try and avoid hitting. Cafés, restaurants and small boutiques are particularly challenging as you try and avoid running over feet and blocking access areas. Top tip: Avoid places that are too small and opt for sitting outdoors where possible if you can. Otherwise you’ll need to consider parking the pram outside or out of the way, in which case be prepared to have to hold your baby and carry all your valuables with you. It is actually easier to have a baby carrier with you for situations like this. At least until your bub is old enough to sit in the highchair. 5. Do I shop with or without the pram? The pram always seems like a good idea when shopping until you’re laden down with dozens of bags, your baby has toilet paper and nappies nestled on their lap and you don’t have a spare pinkie to push them home. Add to this the fact that some shops, such as the supermarket check-out area, aren’t really designed for all prams fit through and now you’ve got a juggling act on your hands. Top tip: Think about what you need to get and cater accordingly. If it’s a giant supermarket shop then ditch the pram and pop them in the trolley (many these days have newborn seats you can lie them down in). But if it’s only a few items then the pram is great as you can pop some things underneath or hang a bag off the back. Also consider using a baby carrier – this way you’ll have your hands free to carry a basket, select the items you need and carry it all. You’ll never appreciate the joys of having two hands free more. 6. How do I get it in the car? Perhaps your husband has set the pram up for you, which is great but do you know how to compact it to fit in the car boot, and likewise expand it again on the other end? You don’t want to spend half an hour crying in a carpark with a screaming baby as you attempt pram origami. Top tip: Before heading anywhere that’s not on foot practice putting the pram in and out of the car, or get someone else to show you. Sounds silly but trust us you won’t regret it – it can be a lot harder than you think! 7. Can I take it on the beach/grass/rocks? Pram pushing is great on flat roads and pavements, but what about other terrains like the park, sand, mud and rocks? If you’ve never wheeled it there how do you know? Will you get bogged or puncture the wheels? Will it be too uncomfortable for bub? Top tip: If you’re unsure, don’t go there girlfriend. Sharp rocks or anything similar will probably rip your tyres and be really bumpy for your baby. Grass, dirt and sand are all fine too but use your common sense – if it’s deep sand you’ll struggle big time, mud is going to be super messy and make your pram really dirty, and water? Well settle down mama, that’s just way too adventurous. Did you find navigating your way around with a pram difficult the first time?